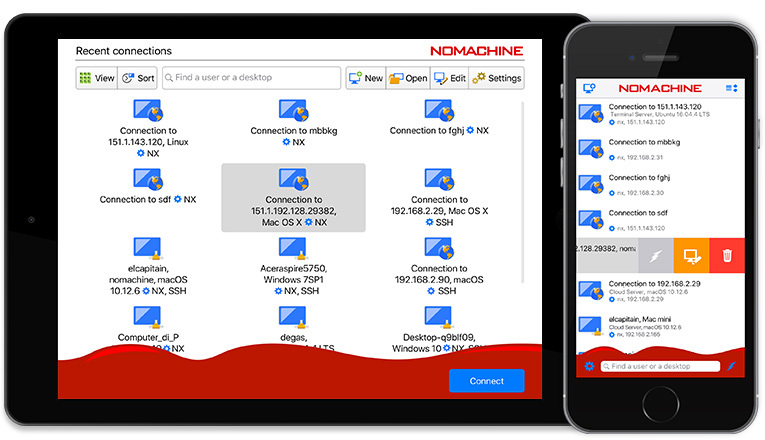 NoMachine for iOS lets you take control of your NoMachine-enabled computer anywhere in the world. Follow the steps below to enjoy remote desktop access on the move and have an all-around outstanding user experience. 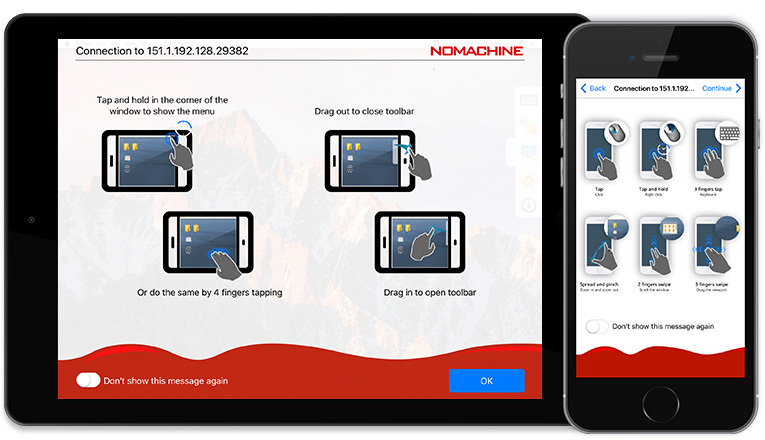 Download the NoMachine package for your OS (Windows, Mac or Linux) to the computer that you want to control remotely. After completing the download, launch the installer. Accept the license agreement and click Next and wait while Setup completes the installation. 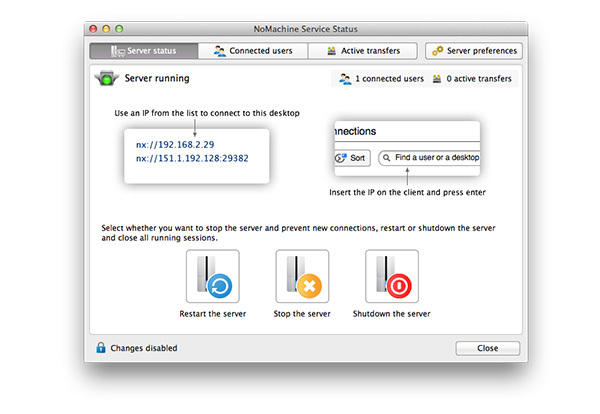 Open NoMachine from the programs or applications menu. You will see that NoMachine publishes both the local and public IP address of the computer on which you have installed the software. 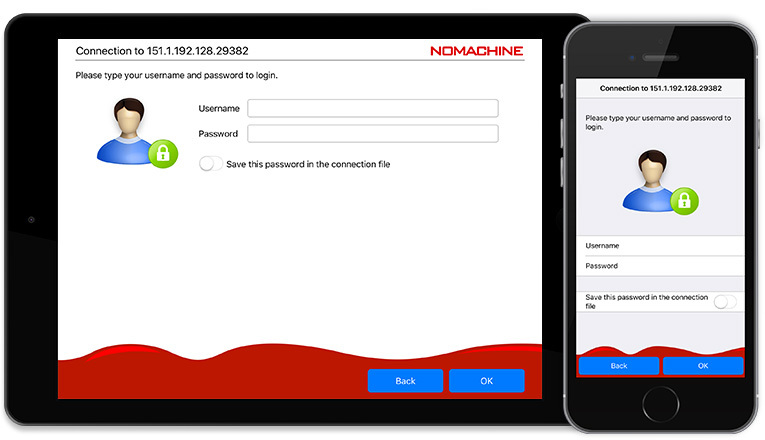 NoMachine can detect all NoMachine-enabled computers on the same network which are available for access, and will be detected by your NoMachine App on iOS in the next stage. However, if you want you can also configure your connection manually, so make a note of the IP address. If you want to connect to this computer over the Internet, you will need to know its external IP address and its port number. It will be displayed like this: nx://151.1.192.128:29382 (Fig.1). Write this information down. If a port number is not displayed next to the external IP, NoMachine has detected that you don't need it in the next phase. TIP: If the Welcome Panel doesn’t appear, it may be that you previously checked the box “Don’t show this message again”. 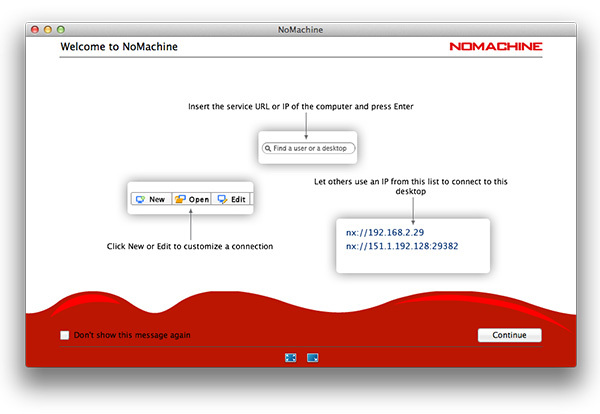 In that case, the IP address of the computer you want to access can be visualized in the NoMachine Service Status panel by clicking on the !M icon (the NoMachine Monitor) in the desktop’s system tray (see Fig. 2). Visit the Apple Store to download the NoMachine app for iOS. Tap the NoMachine icon (!M) on your device to begin. Use the Connection Wizard to be guided through creating a new connection, or tap Continue to skip it. A list of all NoMachine-enabled computers on the same network appears, and if you have already used NoMachine in the past, any connections you created will also show up here. There are two ways to start a connection: i) double tap on one of the NoMachine hosts in the list, or ii) if there no hosts in the list, use the Quick Connect by inserting the IP address and port number you noted down earlier (see Fig. 1) like this: 151.1.192.128:29382 and tap Connect. Now proceed to Step 2. You will be prompted to log in using the credentials for your account on the remote computer. Use your usual account credentials. Tap and wait a few more seconds while NoMachine connects you to your remote desktop. Step 3: You are connected! Welcome panels will illustrate the touch controls and gestures. Tap OK (Fig. 5). Congratulations! Your remote desktop is now at your fingertips (Fig. 6). 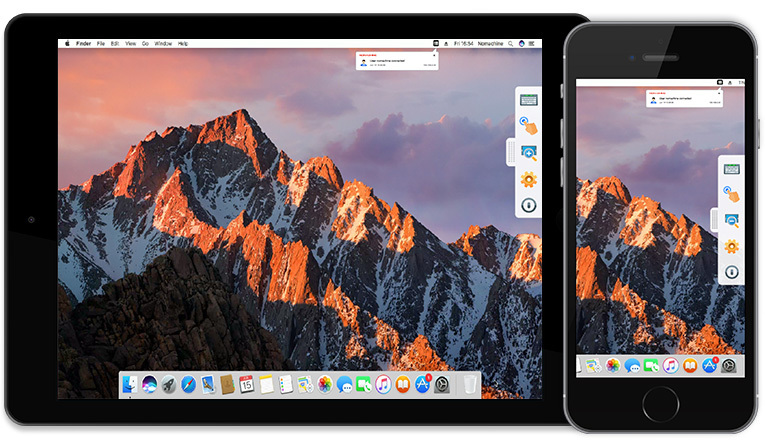 You can now control your remote Windows, Mac or Linux desktop, open and edit files to work on documents, listen to your playlist, watch your favorite films, all from remote. Fig. 6 - You are in, enjoy!